How about 9120 drams – all in one bottle – that’s over 60 gallons! The bottle stands 5’5″ tall and is filled with Famous Grouse whisky. Bottle after bottle was poured in by hand, taking more than three hours to fill! Fomous Grouse is now in the Guinness Book of World Records for the biggest bottle of whisky. It was part of their 107 anniversary celebration. The bottle will be on permanent display at the Glenturret Distillery in Crieff. It would have gone well with the world’s largest haggis, made in Mauchline, Ayrshire. The haggis weighed in at about 1200 pounds. The big challenge was cooking it and lifting it without splitting the skin! The whisky will be kept, but the haggis was addressed and eaten on Bleaching Green in Mauchline – where Burns met Jean Armour. Professor Peter Higgs may have kept a low profile for most of his life – but that is now changing. Throughout the world, people are becoming aware of the famous Higgs boson particle that bears his name – the so-called “God particle” – which answers the basic question of how matter acquires mass. Prof Higgs, 83, has been waiting since 1964 for science to catch up with his ideas about the Higgs boson. It was in that year he dreamed up the concept in a moment of inspiration while walking in the Cairngorms – a particle present throughout the universe which lends mass to matter and holds the universe together. The quiet physicist, retired from the University of Edinburgh, is fast becoming a global celebrity as creator of the theory behind the “God particle”. Born in England, the son of a BBC sound engineer, Prof Higgs’s groundbreaking proposal was that particles acquire mass by interacting with an all-pervading field spread throughout the universe. The more they interact, the more massive and heavy they become. Scientists using the Large Hadron Collider at CERN to look for the fabled particle, have said the search could soon be over. Never one to blow his own trumpet, Prof Higgs is described by friends and colleagues as “very unassuming” and shy. Some believe his retiring nature might even have held back his career. Now, despite his best efforts to keep a low profile, the spotlight is turning on him. The most ancient and most noble Order of the Thistle is the highest honor Scotland can bestow. It is the Scottish equivalent of the Order of the Garter, but fewer people are installed into the Order of the Thistle. The number of knights is limited to 16, and a new one is appointed whenever a knight passes away. Prince William joins family members already in the order: HRH Queen Elizabeth II, HRH Prince Charles Prince of Wales, HRH the Duke of Edinburgh, and the HRH Princess Anne Princess Royal. The Earl of Strathearn – as the prince is known in Scotland – joined the other existing knights in the order which has been running in continuous form since 1687. Historians are divided on the origins of the order, although the tradition is thought to date back to 809, when Achaius, the Pictish King of Scots, formed an alliance with Emperor Charlemagne of France. Some accounts believe Achaius established the order in 786 after winning the Battle of Athelstaneford in East Lothian, when he reputedly saw the cross of St Andrew in the sky. The ceremony took place in one of Edinburgh’s best-known landmarks, the Chapel of the Order of the Thistle, in St. Giles’ Cathedral. The chapel was only recently added to St Giles’ Cathedral, just over a century ago, but it is one of Scotland’s most breath taking architectural treasures. When the order was revived by James VII, the number of knight’s was 12, to symbolise the 12 apostles of Christ. There has always been a strong religious element to the order. Perhaps the most popular member of the royal family, Elizabeth Bowes-Lyon came from Scottish nobility and a direct line to the Royal House of Scotland. Yes, even though there has been no English blood in the royal family since 1066, there is a lot of Scottish blood. In fact, in the Union of the Crowns in 1603, it was the Scottish king who took over the English throne! Although Queen Elizabeth’s mother married into the royal family, she herself came from Scottish nobility, growing up in Glamis Castle, as daughter of the 14th Earl of Strathmore and Kinghorne. She was also related to the Duke of Wellington, who defeated Emperor Napoleon. Her mother was descended from a British Prime Minister William Cavendish-Bentinck, and a Governor-General of India, 1stMarquess of Wellesley, who was the elder brother of that famous Duke of Wellington. A typical Scot, she was famous for her strong principles, physical courage and sense of duty. Peter Ustinov wrote of her facing a student riot at the University of Dundee in 1968. When students were throwing toilet rolls like streamers, she got out of her car, picked one up, and approached the student who’d thrown it. “Was this yours? Oh, could you take it?” The student was dumbfounded, and the mob quieted and backed away. If you want to know how to live to be a hundred, you might look to her love of the occasional alcoholic beverage. She drank gin – and Dubonnet – and port – and martini – and champagne. She is estimated to have enjoyed 70 alcoholic drinks a week! Once, when a case of drink was given for the Royal party at Christmas, but it wasn’t known if they would be coming, she said: “Well, I could polish the whole lot off myself.” But nothing ever interfered with her performing her duties. She opened events, attended funerals, was never concerned about the popularity of her duties. She was active in showing herself and helping end racial inequality in South Africa. She survived many illnesses. She was twice a cancer survivor, and overcame many accidents. When a fish bone stuck in her throat, and she was rushed to an emergency operation, she joked afterwards “the salmon have got their own back.” What else would a Scot say? Her beloved husband, King George VI, died in 1952, and she became “Queen Elizabeth, the Queen Mother” to avoid confusion with her daughter Queen Elizabeth II. 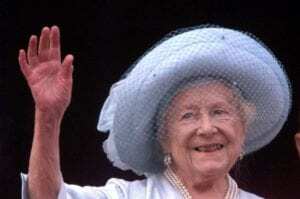 To the public, she was affectionately known as the Queen Mother, or simply the Queen Mum. She loved dogs and horses, and was an excellent judge of race horses, particularly steeplechasers. She owned horses that won more than 500 races, although she never placed bets. In 1995 her right hip was replaced. In 1998 her left hip was replaced, following a fall at Sandringham stables. Her 100th birthday was celebrated with a commemorative £20 banknote issued by the Royal Bank of Scotland (Scottish banks are allowed to issue their own banknotes – if you’d like to see, I have some. Last time I was back, they had become unacceptable in Scotland, but were still legal tender in England!). At one celebration event, the Archbishop of Canterbury mistakenly went to pick up her wine glass, only to be admonished by the alert centenarian’s “That’s mine!” which caused widespread amusement. She broke her collar bone later in the year, and in December 2001, the 101 year old fell and broke her pelvis – but still insisted on standing for the National Anthem at the memorial service for her late husband. Just three days later, her second daughter, Princess Margaret died. The queen Mum fell at Sandringham House and was in a wheelchair with a badly cut arm – but she was determined to travel from Norwich to Windsor, to attend Margaret’s funeral, two days later. Seven weeks later, she passed away in her sleep, at the age of 101, with Queen Elizabeth II at her bedside. The London Scottish, wearing the hodden grey since 1859, became part of the Gordon Highlanders in 1937. Mary Queen of Scots - The First Soccer Mom? The daughter of King James V of Scotland, Mary Queen of Scots was a sports enthusiast. She played golf – and tennis – and apparently soccer. That would make Mary de Guise the world’s first soccer mom! Recently, a small leather ball was found behind the oak paneling of a room that was once the bedchamber of the Scottish Queen. Since this was Mary’s bedchamber, it is believed that all objects found there would likely have belonged to the Queen herself. Researchers have determined the ball to be the world’s oldest soccer ball. Today’s golf balls are made of several layers of different materials to improve performance. Apparently the Scots were well aware of that technology almost five hundred years ago. This ball has a cricket ball at its center, contained inside a pig’s bladder to allow for inflation, and encapsulated in a stitched leather covering to give it a smoother bounce and roll. Mary had a short but eventful life. She was only 6 days old when her father died in 1542 and she acceded to the throne of Scotland. She was widowed at 18; married 3 times, after the Scottish parliament annulled her engagement to Prince Edward of England; and executed for treason at age 44. In her short life, Mary was Queen of four nations: Scotland, France, England and Ireland. It seems the period from 300 AD to 900 AD may not have been as dark as previously thought. This is a time that Scotland has traditionally been portrayed as a nation of blue-painted Picts warding off marauding Vikings. Alice Blackwell, a Glenmorangie Research Officer with Scotland’s National Museums, has spent the past 3 years studying artifacts from the period, and she disputes the gloomy picture of the Dark Ages. The Picts inhabited only part of Scotland, and other social groupings conducted trade and exchanged intellectual ideas with much of Europe. Glenmorangie, it appears, is giving us more than single malt. Alice Blackwell’s book “A Jewel of Gold Placed on a Silver Dish” will be published in the fall. The Stone of Destiny – that ancient royal seat of Scotland, where kings were crowned -may be the Stone of Irvine. One thing is sure, it has moved around a lot in its history. Legend has it being taken by Jacob while in Haran. Legend also has it being brought from Ireland by the Dalriata gaels when they settled Scotland. More likely is the story of Fergus, son of Ferchard, the first King of the Scots in Scotland, bringing the Stone from Ireland to Argyll, where he was crowned on it. The Scottish philosopher and historian, Hector Boece (now it would be Boyce, as in Pittsburgh’s Boyce Park – see, the Scots are everywhere), believes the stone was kept in the west of Scotland, at the lost city of Evonium. Evonium was itself founded by Evenus or Ewin (now called Irvine) – and yes, there is a town named Irvine, in Ayrshire. Evonium is chronicled to be the place where forty kings were crowned. It is also believed by some historians to be the ancient capital of Scotland, sited not far from Oban, and close to the religious center of Iona. Scots historian A. J. Morton, believes that Irvine was an important center in the Middle Ages, and that John Baliol, the Royal Lord of Cunninghame, was the titular lord of the town of Irvine, and the last Scottish king crowned on the stone in 1292, before it was taken to Westminster in 1296, The town of Cunninghame (coming from “King’s Home”)was once known as Erewyn or Erevine or Ervin. The Stone of Destiny is a block of reddish sandstone, known as old lower red sandstone, which is found near Scone. But the same old lower red sandstone is also found in Ayrshire – around Irvine. For Morton, it makes sense that the capital would be closer to Ireland. Of one thing we can be sure. There is a long history of kings being crowned on the Stone. In the 14th century, Walter Hemingford, cleric and historian, described the Scottish coronation stone as residing in the monastery of Scone, a few miles north of Perth: He wrote: “In the monastery of Scone, in the church of God, near to the high altar, is kept a large stone, hollowed out as a round chair, on which their kings were placed for their ordination, according to custom”. So the stone comes from the mists of history – was taken to London in 1296 as spoils of war – was promised to be returned in the Treaty of Northampton of 1328 – was kept for another six hundred years – was bombed by suffragettes in 1914 – was stolen back by students in 1950 – returned to Westminster in 1951 – and was officially returned to Scotland in 1996. It now resides in Edinburgh Castle – from where it will be transported back to Westminster for use at the next coronation. PS No one is quite sure that the Stone that now resides in Edinburgh is even the real stone! Many believe the monks of scone hid the real stone in the river Tay or buried it on Dunsinane Hill – which would mean we’ve been squabbling for 800 year over a 300 pound lump of sandstone! The Scottish Government has launched a free iPhone app which contains the entire works of the Bard – over 550 poems and songs! Culture Minister Fiona Hyslop called the new app “a great platform” to promote Burns. She said: “Robert Burns is Scotland’s greatest cultural icon, recognized and celebrated all around the world. His legacy is of incalculable value to Scotland and the country’s image abroad.” If you have an iPhone, free downloads are available – just in time to be a silent prompt for that Burns Night speech, and that awful moment when your mind goes blank over a poem you’d remembered your whole life! A Dram in a Can? A Dram In A Can? Oh no! What’s the world coming to? Scotch whisky connoisseurs are up in arms over “Sir Edwin’s tinned whisky”! It’s being sold in the Caribbean and in South America. But hold onto your kilt! You don’t need to panic just yet! The company producing Sir Edwin’s, Scottish Spirits, is based in the Highlands. It’s in Panama. And the CEO bears the well-known Scottish family name of Manish Panshal! The Highlands and Islands are to receive £18m in EU cash aid from the European Regional Development Fund. These funds are to assist the area in tourism and renewable energy. More than £1 million will go to a visitor center for the chambered tomb of Maeshowe on Orkney, and the Highlanders Museum Redevelopment Project near Inverness will get almost £1 million. The Highlanders Museum has been generously funded by actor Hugh Grant, who has raised money for it in honor of his grandfather Colonel James Murray Grant, who was a senior officer at a nearby artillery fort. This museum has a military flavor, and is dedicated to the Seaforth Highlanders, the Queen’s Own Cameron Highlanders, and the Queen’s Own Highlanders. This university is set to join other Scottish universities in the new year. It has met the standards required for institutions of advanced learning. The final decision will be made in the near future by the Privy Council of the Scottish government. UHI colleges are currently scattered throughout the Highlands and islands, in such places as: the Orkneys; Shetlands; Lews castle; Moray; Ostaig; Inverness, Perth; and Argyll. The museum contains 5000 artifacts from Burns’ life, including manuscripts and personal items like a piece of Jean Armour’s wedding dress. The museum is an attempt by the National Trust for Scotland to bring together other Burns’ sites, including the Burns’ National Park, the Burns’ Monument, Alloway Auld Kirk, Burns’ Cottage, and Auld Brig o’Doon. The NTS hopes to attract 80,000 visitors a year to learn more about the national bard. For more information, go to: Scotsman.com -Heritage & Culture. This new series is moving from radio to BBC II Scotland. You probably won’t be able to watch it here yet (it takes a while for these wonderful Britcoms to reach here), but it sounds great. Characters like Jim and Jock, Mither and Faither, and Man’s Man, fill this comedy sketch show set against the spectacular backdrop of North Eastern Scotland. Mither and Faither’s life looks like it should be idyllic. The kids have left home, they can afford good holidays and although now middle-aged they are still comfortably in love. Everything is fine, except for two annoying things – their friends Selma and Eddie. Jim and Jock are farmer and farm labourer respectively, both live in the “Brig O Doon” village of Meiklewartle where they have decided to set up a community television station, MTV Meiklewartle Television. They are assisted by the village wench / camera person Feel Moira (Mad Moria) so the pictures are a wee bit wobbly. If you can’t watch it yet, try keeping up-to-date on Desperate Fishwives on www.facebook.com. The Sound of Islay will be home to the world’s first tidal energy project. The Sound of Islay lies between the Island and Jura, and was selected because of its powerful sea and predictable tides. By harnessing these tides, this project will generate enough electricity to power 5000 homes. Bigger projects are already planned for the Pentland of Firth off Caithness, as well as for the waters off Orkney. And don’t worry about big platforms and rigs. This system will be sitting on the sea bed, fully submerged. Scottish Power Renewables expects to be producing electricity commercially in 2012. A priceless chanter from the 1600s is being returned to its native land after more than 200 years in exile. The chanter once belonged to the legendary Blind Piper of Gairloch, Iain Dall MacKay, who was born at Talladale on Loch Maree and trained as a piper on Skye. MacKay (1656-1754) was a true Gaelic bard. He was not only a piper, but he also accompanied his poetic songs on the harp. But it’s his piobaireachd compositions that established his reputation as one of the greatest pipers who ever lived. His descendant, John Roy MacKay emigrated to Nova Scotia in 1805 and took the chanter with him. But not everyone is happy. Dr. John Gibson, a piping scholar in Cape Breton, believes the transfer breaks Canadian heritage law, which forbids the export of national treasures. He has taken legal advice to get it back. It wasn’t washed ashore from a shipwreck, but it may have gone down the drain. The heavy snows last winter caused some of the Glenfiddich warehouse roofs to collapse, exposing the oak maturing casks. Imagine the horror, the sheer panic! It sounds a bit like “Whisky Galore” revisited. With temperatures at minus 19C, the workers at Glenfiddich had to leap into action and work round the clock to save the precious brew. Exposed casks were rescued, and the whiskey was moved to new casks (some made of American Oak). This rescue operation has resulted in a new single malt called “Snow Phoenix”, which is dedicated to Scotland’s Mountain Rescue – and available to the public at £49.99 a bottle. www.Scotlandspeople.gov.uk offers free surname searches from the government records dating back to 1513. The web site www.AncestorsOnBoard.com offers passenger lists for voyages leaving Britain from 1890-1960 with images available to download, view, save and print.